﻿ The Herriott Hotel & Suite Danang, Da Nang | FROM $21 - SAVE ON AGODA! "The room was very spacious and they gave us a free upgrade." 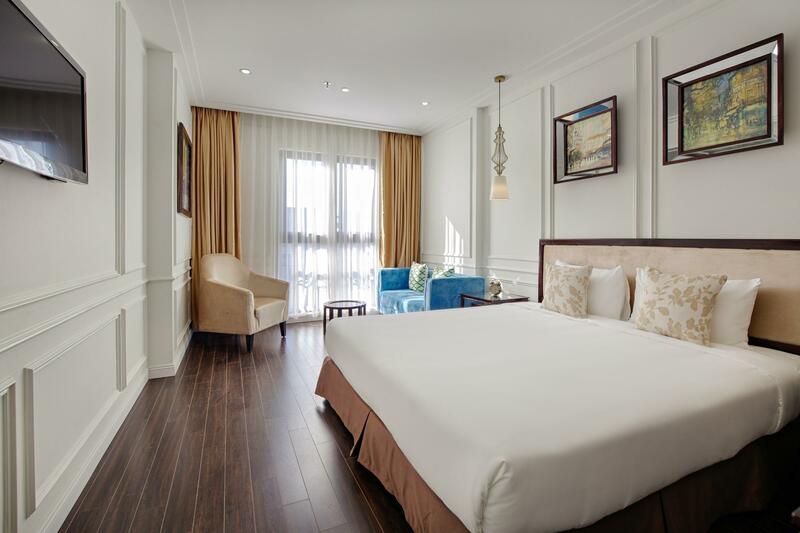 Have a question for The Herriott Hotel & Suite Danang? "Location is very convinient, couple shoppings centers are near by"
"The girls at the reception were nice and helpful." "Room is big , beds are comfortable , great price for a such a room like this one!" "The room are very nice, staffs are very friendly." Located in the lovely area of Phuoc My, The Herriott Hotel & Suite Danang enjoys a commanding position in the family fun, sightseeing, beaches hub of Da Nang. Situated only 0.8km from the city center, guests are well located to enjoy the town's attractions and activities. With its convenient location, the property offers easy access to the city's must-see destinations. The Herriott Hotel & Suite Danang offers impeccable service and all the essential amenities to invigorate the weary traveler. A selection of top-class facilities such as free Wi-Fi in all rooms, 24-hour security, daily housekeeping, wheelchair accessible, kitchen can be enjoyed here. All guest accommodations feature thoughtful amenities to ensure an unparalleled sense of comfort. Recreational facilities available at the property include outdoor pool, spa. Superb facilities and an excellent location make The Herriott Hotel & Suite Danang the perfect base from which to enjoy your stay in Da Nang. Charming Boutique Hotel - floor area outside rooms are filthy and need polishing and scrubbing.. once they understand how to clean better this would be much better. Security staff are uncomfortable with western tourists and need training how to be nicer rather than scowling and have manners.. The one elevator is a nightmare.. overall has great potential but needs direction and visit other hotels that supply a better product..
Room is big with charming design. However it seems that facilities are not made by good materials and many of them are useless. Bath room is not clean at all. Location is un-walkable to both city as well as beach site. Breakfast is limited. I will not stay again. Pros : Clean hotel and nice staff. They smiled us every moment we met. Breakfast is basically buffet type but also you can order fried egg, omelette or noodles. Pool was on the top of the hotel. Water was quite cold because it was winter season of Danang but i think it will be nice if it’s summer time. Cons : it was good location for beach but little bit far from downtown. We normally walked but if it’s summer season, it will be hard. 8 travelers found this review helpful. Did you? The hotel is not too far from airport, near by restaurants and shopping malls. Breakfast a bit disappointed, foods was cold and have to clean up table by ourself ( staffs were eating behide the counter ) . The girls at the reception were nice and helpful. Room is big , beds are comfortable , great price for a such a room like this one! This hotel is off the main road but pretty close to the beach and city. The room was very spacious and they gave us a free upgrade. The beds were comfortable and the room felt secure. The WiFi was a little weak but that would t stop me from staying again. 11 travelers found this review helpful. Did you? We loved staying here so much which made us so sad that we couldn't extend 1 more night because it was fully booked. We loved the design, the coziness, the pool, the bed. Everything you needed is here. Highly recommend! 12 travelers found this review helpful. Did you? I feel like i'm staying my home , everything was perfect! Staffs really friendly , the room awesome. I don't know how to describe my emotion when i stay here but if u go to Da Nang City this is the best place for you ! 10 travelers found this review helpful. Did you? Everything’s so so good here!! The staff are so nice like family! I felt so comfortable and taken care when I was there! They will literally try their best to help you with anything. This experience made my trip in da nang became a wonderful dream. Felt so lucky! If I go to da nang again I’ll definitely choose this hotel again! Thank you guys for everything! Really! he staff are very friendly and helpful. There is a free bike rental there and the bikes have little baskets and also has a seat in the back for younger kids who don't know how to bike. You can also rent scooters from the hotel which we found very convenient. The location is great and if you wanted to go to busier areas, you just hop on a bike. Beds and pillows were very comfortable; buffet breakfast in the morning was nice as they have an egg station, a noodle station, salad, bread and a variety of local foods as well. 9 travelers found this review helpful. Did you? Khách sạn giá khá rẻ nhưng chất lượng phòng như 4 sao. Rất đẹp, rộng và sang trọng. Mình ở phòng Grand Deluxe Double cửa sổ rất to, rất thoáng. Vị trí nằm gần sông và cả biển, rất tiện lợi nhưng ko sầm uất, ồn ào. Bạn nào thích yên tĩnh nhưng vẫn nằm trung tâm TP thì nên chọn khách sạn này. Khách sạn cảm ơn chị Phương Trinh rất nhiều. Hẹn gặp lại chị trong những chuyến công tác sau nha. The facilities in the room were wonderful for the cost. The bed was very comfortable, and the aircon was wonderful, it was cool without being cold, and very quiet. The staff were lovely and helpful, especially with arranging a taxi. 6 travelers found this review helpful. Did you? 7 travelers found this review helpful. Did you? Awesome hotel! · This is our fourth visit here! The service and hotel is consistently awesome. Besides the best price for the very high quality, the rooms are clean and modern, comfortable, and classy - and it's so close to the beach. The view is gorgeous! We'll be back! The hotel is not so big but very cozy and lovely. The staffs were nice and friendly, especially Mr. Security Man on our 2nd day. After an unexpected hotel experience in Hoi An, we were really happy when we entered the room here. It's only 22m2 but not felt too cramped. It's a elegant room with modern decorating details, a big queen bed and a huge window. However, we expected great city view but the view of our room was regrettably a building under construction! What a waste of a big beautiful window! The pool and restaurant are on 8th floor. They are quite small but the view here's great. Food is not too varied but delicious. Location is ok. It's not too far from the beach and Han River. Good value hotel with rooftop and swimmingpool near to the beach in walking distance 15 minutes. Some staff is very friendly and some are distanced. Confusing is from guest perspektive what is in mini bar free and what is to pay, 2 different typ of water are in the room and later is water to pay. Overall good. Breakfast can be improved.